Given the growing importance of food safety and the relationship with pallets, mold found on pallets has faced increased scrutiny. In industries such as pharmaceutical and food, the demand for mold-free wood pallets and packaging has intensified. Ralph Rupert, Manager Unit Load Technology, Millwood Incorporated, stresses that mold spores are found everywhere in the environment. Speaking at the WPA Annual Meeting, he noted that in order to grow, mold requires oxygen, a food source, and moisture. Restricting moisture content is the most practical method of limiting mold growth, although there are also chemical treatment approaches that attack the other required constituents, discussed further below. “Water is a hygroscopic material,” Rupert elaborated, noting that as such, wood absorbs moisture from its surrounding environment. This is a characteristic that leads to issues - not only to mold but as well as to dimensional issues as wood cells shrink with drying. “Moisture causes more problems with wood than all other issues combined,” he said. The key to preventing mold, according to Rupert, is to keep the moisture content of wood below the fiber saturation point, in the 20 - 25 percent moisture content range or lower. This obviously involves keeping pallets dry and preventing exposure to rain, humidity and other sources of moisture. Inside storage is recommended. Ensure the area is ventilated. Rupert stressed that only a little air movement is required, noting that stagnant air is detrimental to surface moisture evaporation. If the surface becomes saturated, then mold can germinate. "Air flow as little as two feet per second is all that is needed in a storage environment. Do not store pallets on trailers. Rupert says that rather than storage trailers, such vehicles should be referred to as "incubators" because of the humid, stagnant conditions inside that are amenable to mold growth. Be sure to store pallets and lumber off of the ground. Regularly take moisture content readings. 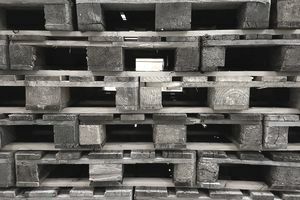 Rupert stresses that contrary to the beliefs of a surprising many, heat treatment, the preferred method for eradicating wood pests that can hitchhike in wood pallets and packaging, is not an effective treatment for mold. In fact, heat treatment draws moisture to the surface, and a such can actually create conditions that promote mold growth and exasperate the problem. While the discussion above is centered on eliminating free water that can result in mold growth, chemical treatments take different approaches, according to Rupert. One leading product, X-Mold, works on the encapsulation aspect. It creates a barrier that prevents oxygen from being available for mold formation. Other chemical treatments are copper formulations or others that act as moldicides, inhibiting mold growth. As environmental conditions can range, it is best to discuss your application with a provider, and perform testing. The effectiveness of chemical applications can range from a few weeks to as much as 90 days, depending on the situation. In summary, Rupert emphasizes that moisture control is the key to mold control, and that surface moisture below should be maintained below the fiber saturation point, in the 20/25 percent range. Keeping free water off the surface of the wood is essential, and proper storage is essential to moisture control.